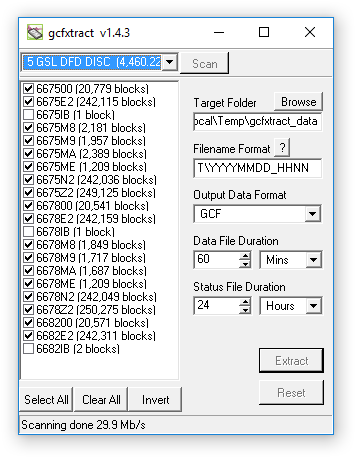 gcfxtract is a multi-platform tool for reading disks which were written in the DFD format, as used by Guralp digitizers, including 6TD digital instruments. GCFXtract.gz v1.4.3 for Linux i386 (408K .gz). The program requires the same libraries as Scream!. If you have problems with dependencies under Windows, moving the program file into the same directory as Scream! or its libraries may resolve them. When you start up gcfxtract, the program searches all SCSI interfaces and devices for DFD-format disk drives. The ID of each disk is displayed in the drop-down list at the top of the window. Under each disk, gcfxtract lists the transfer sessions it has found on the disk. The digitiser creates a new transfer session each time it saves data to the disk. You can extract data either from a single transfer session or from the entire disk. Select the required disk or transfer session from the drop-down list, and click . gcfxtract will scan the disk and display all the streams it finds in the selection area below. For each stream, the Stream ID and the number of blocks found are shown. This operation requires roughly 12 Mb of available memory for every Gb of space on the disk. If you have a very large disk, your computer may have to use its hard disk to make enough space. This will slow down scanning considerably. By default, all streams containing more than 100 blocks are selected for extraction. You can change which streams to extract by checking or unchecking the check box beside each stream. You can check or uncheck all of the boxes using the all and all buttons. Clicking checks all unchecked boxes, and unchecks all checked boxes. Enter a path name into the Target Directory field, or use the button to find a directory. This will be used as the root directory for extracted data. If it does not exist, gcfxtract will create it. Enter a format string into the Filename Format field. The syntax is the same as the format string in Scream! and full documentation is available by pressing the button beside the format entry field in interactive mode. Normally, gcfxtract outputs GCF files, to ensure all the information in the original data is retained. If you want to convert to a different format, select it from the Output Data Format drop-down menu. gcfxtract can output in most of the formats supported by Scream!. Some formats require additional information to be specified: additional items will appear in the application's display will change to reflect this. Data are automatically placed in time order and saved in multiple files, each file containing a contiguous segment of data. By default, data streams are recorded in files 60 minutes long. To change this to some other number of minutes, alter the value in the Data File Duration (mins) box. For data streams, if there is a gap in the data, gcfxtract will start a new file anyway. Status streams are also saved in multiple files, but have a default length of 24 hours. To change this, alter the value under Status File Duration (hours). When you are happy with the settings, click to begin extracting the data. Clicking sets a flag on the disk which marks it as empty. The next time a digitizer wants to transfer data, it will begin at the beginning of the disk, overwriting the old data. When this happens, none of the old data can be extracted with gcfxtract or ReadSCSI. Until then, however, you will still be able to retrieve all the data. /o:dir : Set the Target Directory to dir. /f:format : Set the Filename Format to format. The format string is in the same format as that for Scream! and is documented by pressing the ‘?’ button next to the format entry field in interactive mode. /d:data-format : Set the Data Format to data-format. Possible values are gcf, miniseed (or msd), saci (Intel byte order), sac (Motorola byte order), suds (or sud), gse (or cm6), segyi (Passcal SEG-Y, Intel byte order), segy (or sgy, Passcal SEG-Y, Motorola byte order), segys (standard SEG-Y, with shot-files), cssi (Intel byte order) and css. /ld:duration : Set the Data File Duration to duration minutes. Alternatively, add h to the end of the duration to specify a number of hours, or d to specify a number of days. /ls:duration : Set the Status File Duration to duration hours. Alternatively, add d to the end of the duration to specify a number of days. /t:count : Select only streams with more than count blocks. /a : Batch transfer data from all connected disks, using settings (including stream selections) defined using the options above. /s:filename : Specifies the path to the shot-file. /p190:filename : Specifies the path to the (optional) P1/90 file. Only 'S' records are processed. /pre:value : Specifies the pre-shot data duration in seconds. /post:value : Specifies the post-shot data duration in seconds. /offs : Turns on removal of DC offsets during conversion. The /a option (described above), used in conjunction with disk image files, is useful for building automated data conversion scripts.